When I was 20 years old, I was once biking on the sidewalk on my way to Loyola University to study. Along the way, a policeman on a motorcycle tried to pull me over, calling me from behind. But because I was wearing headphones listening to my Walkman cassette player (for you whippersnappers who don’t know what that is, google it), I never heard him. Finally, he pulled alongside me. I stopped and he told me I wasn’t supposed to be biking on the sidewalk. I told him I wasn’t aware that was a law. He replied that it was and that he was going to take me in. Seriously? Arrested for biking on the sidewalk? After a brief discussion about why I would get arrested for such a petty offense, he sarcastically asked me, “Do you speak English?” As an Asian growing up in a low-income, crime-ridden neighborhood, I was used to racism—even from blacks in that predominantly black neighborhood. But I never anticipated it from a policeman—people portrayed as heroes in the TV shows I watched growing up. I replied back, “Better than you.” With that snarky reply, he handcuffed me and ratcheted it extremely tightly—clearly in retaliation for what I said. I was eventually released on my own recognizance (I believe b/c the other cops knew he overstepped his bounds) and I considered whether or not to file a complaint against the cop for excessive force and/or racism. I decided to drop the matter. That was not my only negative brush with cops either. But the moral of the story is that I personally experienced some of the same things that supposedly caused teenager Michael Brown to be fatally shot in Ferguson, Missouri (not to the same extent, of course, but similar in nature). You might think that because of my experiences, I am outraged or saddened by the grand jury’s decision to not indict Ferguson police officer Darren Wilson. You might think that I am joining the chorus of people who declare the legal system broken and that there was no justice for Michael Brown. You might think that when I read that King Obama is meeting with civil rights leaders about the Ferguson case, I’m excited and hopeful. Did the grand jury really make the wrong decision? If you think those things, you are being played for a fool. Everyone needs to calm down. Readers of my blog know that the Trayvon Martin case wasn’t at all what the media portrayed. So when this case came along, people with Minor Insights should know it’s time for caution instead of knee-jerk reactions. Like the Trayvon Martin case, the media only served up one side of the story in the Michael Brown case. We never heard the other side of the story. Like the Trayvon Martin case, the media only showed us the same one photo of the victim. In this case, an unintimidating neck-up picture of a chubby-cheeked Michael Brown wearing headphones at an arcade with little kids around. How many people knew that that chubby-cheeked teenager was 6′ 5″ tall and 290 pounds—the size of an enormous, hulking pro football lineman? Like the Trayvon Martin case, the media portrayed Brown to be completely innocent—especially with the infamous “hands up” pose. How many people knew that Michael Brown charged at Darren Wilson, giving Wilson no choice but to shoot? How many people knew that Brown was at least an accomplice to a robbery of cigarillos just moments before the confrontation with Wilson? How many people knew that Michael Brown threw punches that landed square on Wilson’s face? Brown completely innocent? If so, I’ve got some land in Florida to sell you. After the grand jury’s decision, Darren Wilson gave an interview with ABC’s George Stephanopoulos that (finally) gave his side of the story. If you think Michael Brown and his parents got the shaft, you MUST watch the video. Even as Stephanopoulos tried to bait Wilson into saying contradictory or self-indicting things, Wilson was consistent in his story. Then there’s the evidence that the grand jury saw. The evidence backs up Wilson’s story. How many people have seen the evidence? Nobody? Yet without any evidence, and without being a witness to the scene, thousands of people fell hook, line and sinker for the media’s portrayal that Brown struggled to get away from Wilson’s car and then was shot with his hands up. Consider horrible Nightline anchor Byron Pitts. In one segment, he interviewed some people in Ferguson as they watched the Wilson interview and asked if any of them had been stopped by police. Everyone said yes. Makes for good TV, but does not make a good point. Just because police have stopped citizens does not mean the police are all racist pigs who are happy to shoot black people minding their own business. Pitts’ question is a red herring. Pitts then ended the Nightline show by saying, “Darren Wilson had a chance to give his side of the story. Michael Brown does not.” Pitts conveniently forgot that the media has been giving Michael Brown’s side of the story ever since the shooting first occurred. I agree the system is broken—but not the way the protesters think. The system is broken in that the media is the one that is the jury to the American people. They don’t report the news objectively, trying to research and report both sides of the story. Instead, they report the most sensational aspect of the news—whatever will cause the biggest furor and thus draw the biggest ratings. I also agree the Michael Brown case is like the Trayvon Martin case—but not the way the protesters think. 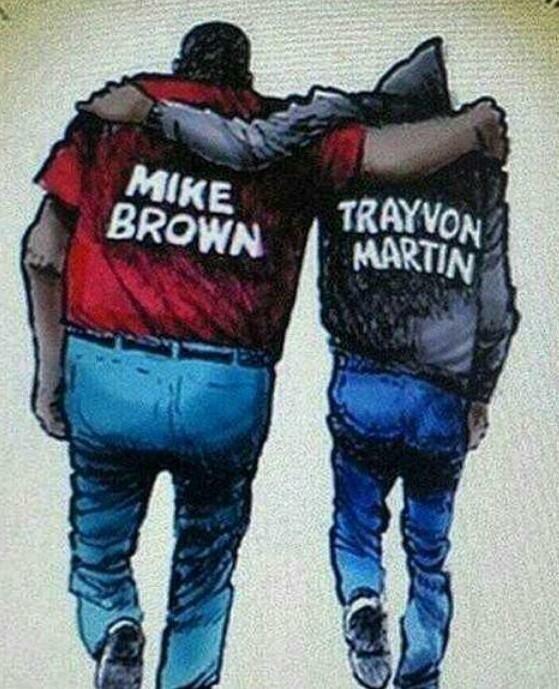 LeBron James tweeted this drawing of Brown and Martin, insinuating that they both got a raw deal in the same way. But the evidence seems to indicate that if you were to look at the front of their faces in this fictitious drawing, they’d have devilish grins, knowing that they both got away with their respective acts of aggression and violence and yet are being lifted up as martyrs in the general public’s eye. I also agree that America has a race relations problem—but not the way the protesters think. Protesters think white people have a racism problem when the reality is that many blacks too view things with racism as the reason. Many of the blacks I grew up with were very racist. In today’s age, much of the racism is hyper-fueled by the media (e.g., Stephanopoulos in his interview kept trying to bait Wilson into saying it was a race-related shooting). When a white policeman shoots a black citizen, many blacks automatically assume the cause was race. Sometimes race does come into play but you have to investigate each instance on a case-by-case basis; you just cannot automatically assume it to be true every single time. If we really want to get serious about improving race relations, it’s critical to not be ignorant. The Ferguson neighborhood Michael Brown died in was a hood—no two ways around it, though most people don’t know that. It’s a crime-infested area and Brown himself has party to a crime just moments before his confrontation with Wilson. It’s sad when people gave Brown the benefit of the doubt instead of Wilson based on ignorance. But it’s even sadder when we loot stores, set cars on fire and make calls to “change the system” based on continued ignorance. Don’t be that person. And to those members of Congress who question my authority to make our immigration system work better, or question the wisdom of me acting where Congress has failed, I have one answer: Pass a bill. Ooooh. Snarky. Too bad snarky isn’t exactly becoming of the President of the United States. One thing King Obama conveniently neglected to mention was that in his first term, the Democrats had control of both the Senate and the House of Representatives. So what is Obama’s excuse for not passing bills then? Last night, Obama showed he is daring Congress to stop him—just two weeks after saying (apparently just ceremonially) that he would work harder to make compromises with Congress. Among the Democrats believed to be at risk are Joe Manchin, Heidi Heitkamp, Jon Tester, Claire McCaskill, and Joe Donnelly. Angus King (who is an independent but caucuses with Dems) is also a question mark. These must be the smart Democrats. If they know King Obama’s actions are not popular with the voting public, they would be wise to not support them if they want a chance to be re-elected. Today, our immigration system is broken, and everybody knows it. It’s been this way for decades. And for decades, we haven’t done much about it. Well, if “everyone knows” the immigration system is broken, NOT “everyone” agrees that Obama’s approach is the best way to fix it. According to a Wall Street Journal/NBC News poll, more people oppose Obama’s actions than support him (48-38). Another way to put it is that nearly half of America oppose Obama’s actions! Which, as John Hayward points out, means that King Obama is more interested in caring about foreigners than caring about Americans. Latinos are divided, with 43 percent supporting the action and 37 percent opposing it. While the article mentions that it’s a small sample size, it’s still noteworthy in that there are many more Hispanics who OPPOSE Obama’s actions than we would be led to believe if we merely watch news footage on TV of pro-immigration Hispanics protesting. I, for all, thought ALL Latinos would embrace Obama’s actions. But they don’t! As Hayward theorizes, American Hispanics could be wary of all these illegal immigrants now being able to “come out of the shadows,” as King Obama put it, to compete for the same jobs as American Hispanics. The American job market is already fragile enough, with more people looking for work than there are available entry-level jobs, that American Hispanics perhaps realize they don’t need more competition for those jobs. That quickly spawned two new hashtags: #fruitpickers and #bedmakers. Hey, who said Obama isn’t a great orator? The ironic thing about all of this is that Obama campaigned in 2008 in part on his image as a uniter: an upper-class black man from Harvard who can connect with whites by virtue of his class status and educational status and who can connect with blacks by virtue of his race. In reality, though, King Obama has proved during his six years in office to be arguably the most divisive president in history. And last night’s executive actions encapsulated in one evening the disharmony he has done to this nation on his watch. The sheeple of the state of Illinois became the people of Illinois when enough of them finally woke up to the reality of bungling Governor Pat Quinn and elected Republican Bruce Rauner instead. With clear-minded voters, this shouldn’t have been a close race. Quinn has not found a property tax hike he didn’t like, has no clue how to solve the ticking time bomb that is the state’s pension crisis, has limply watched the state’s jobless rate flounder, called for Chicago school reform but refused to help, calls for useless ban on assault weapons, and opposes parental notice on children having abortions. And all this political infertility despite the fact that he had the support of a Democratic legislature during his five year watch as Democratic governor. Democrats love to promote themselves as caretakers of the poor, yet my parents—who are on Medicare and other government programs—were outraged at how their benefits were cut across the board by—you guessed it—those supposed advocates of the poor, the Democrats. Of course, you won’t hear about these cut in benefits to the poor in the media. But my parents made their voices heard anyway when they voted Republican in this election. The Democrats hoped to help Quinn by boosting voter rolls when they preposterously loosened voting rules, such as no longer requiring photo IDs for early voting. It already is so easy to vote in Illinois, with no photo ID required during regular voting either. And absentee voting is even easier: the ballots are mailed to the registered voter’s house with no confirmation that the person filling out those mail-in ballots is really the same person (I know this b/c my parents voted via absentee ballot and they showed me the entire process). And after the AP and other outlets claimed that Rauner was projected to win the election, Quinn and his cronies cried out that “every vote needs to be counted,” pompously assuming that all remaining votes had his name on them. But on Wednesday afternoon, Rauner’s lead actually increased by 5,030 votes. Yes, Pat, you were technically right in that votes were still uncounted! During the campaign, I thought Rauner spent too much focus on linking Quinn to convicted former Governor Rod Blagojevich rather than focusing on Quinn’s fiscal ineptness. But then again, maybe it hit a nerve with the voting public. I know it hit a nerve with ABC7 political analyst Laura Washington, who was actually offended by Rauner’s claims of Democratic “corruption” and “100 years of failure” during the news station’s live broadcast of the election results. 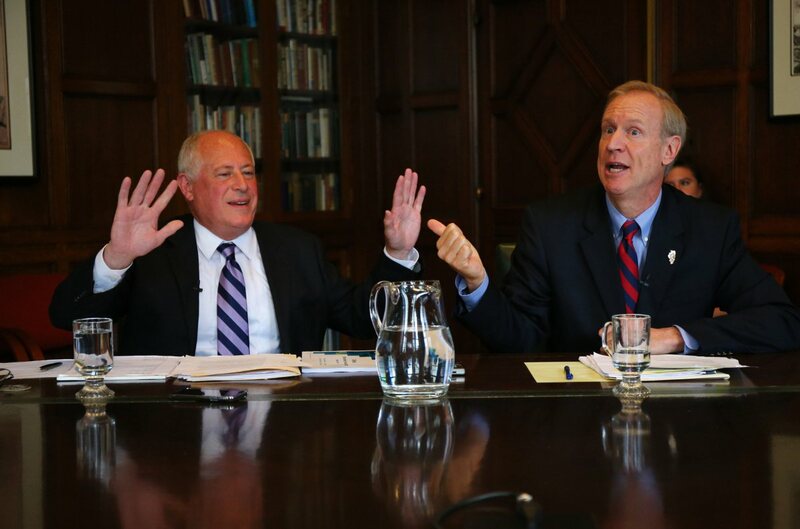 Rauner is a social moderate, so I’m not fond of that aspect of him. And I’ll address the subject of voting the “lesser of two evils” in a future post. But clearly, Quinn was the very bottom of the barrel and it was long past time for him to go. Thank God now Quinn is gone. Even if he refuses to leave. Back in June 2014, Chicago mayor Rahm Emanuel ripped the sign on Trump Tower which spelled out Trump’s name as being “tasteless” and—despite the city already having approved the signage—declared he would seek any possibilities of forcing its removal. Then in September 2014, King Emanuel announced a new city ordinance that would prevent future Trump-like signs along the Chicago River. The fact that people bothered to critique the sign is, well, a sign of the times (pun fully intended). For liberals, you are NOT entitled to your opinion if it contradicts my opinion because my opinion is always right. 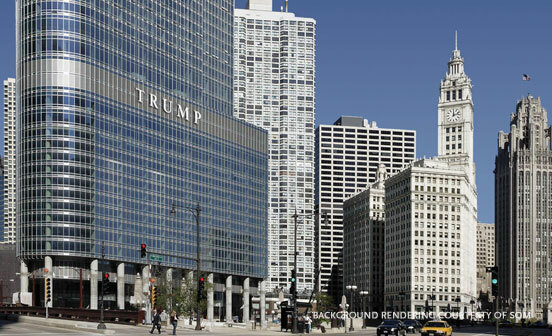 So the liberal Emanuel, emboldened by a critique of the sign by Chicago Tribune architecture critic Blair Kamin, decided to take the conservative Trump to task for his sign. Remember, Emanuel decried the sign as “architecturally tasteless.” Aside from signs that may be phallic in imagery, the phrase “architecturally tasteless” is completely subjective. Building architecture, by definition, is often viewed as “works of art,” and art is wholly subjective. Some people love Vincent Van Gogh’s style of art and loathe Pablo Picasso’s style, and vice-versa…while still others may love both. There is no standard when it comes to art. So what Emanuel perceives as “architecturally tasteless” may be perceived as “architecturally tasteful” to others (like me). Predictably, Emanuel did what liberals love to do: create more legislation and rules. What these liberals don’t realize is that while such legislation is consistent with their worldview, it is inconsistent with the real world. For example, Kamin’s issue with the metal signage on the Trump building is that it clashes with the “cluster of 1920s skyscrapers” and might spoil the view for the city’s Riverwalk. But look at the picture above of the James R. Thompson Center in downtown. The all-glass exterior evokes a definite modern feel reminiscent of a spaceship, yet it is next-door neighbors to many traditional stone buildings built in the 1900s and 1910s. 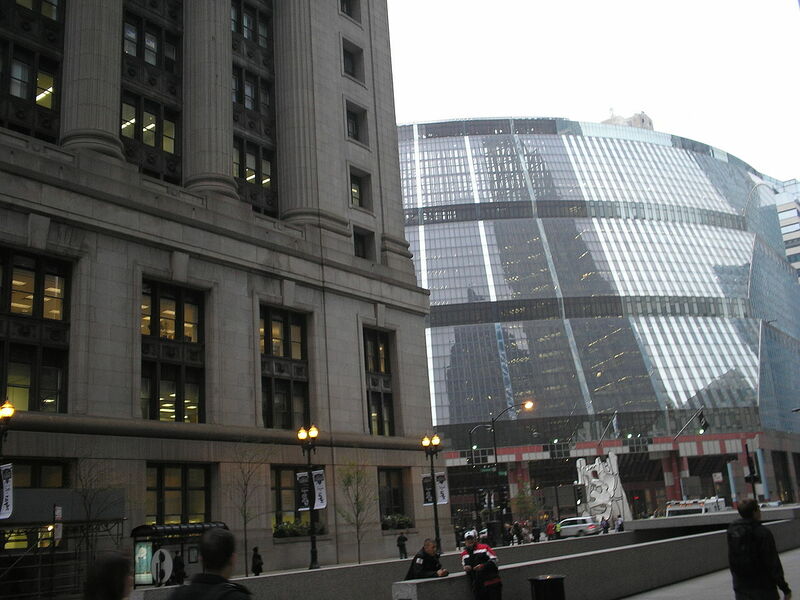 If Emanuel were to be consistent, he would blast the Thompson Center for being “architecturally tasteless” too and push legislation that would ban modern buildings sitting next to traditional buildings. Of course, anyone with Minor Insights would see how ridiculous an argument that is. Yet it is the same ridiculous logic that Emanuel uses to conveniently blast the Trump sign. There are plenty of signs on riverfront buildings. Look on the left photo. 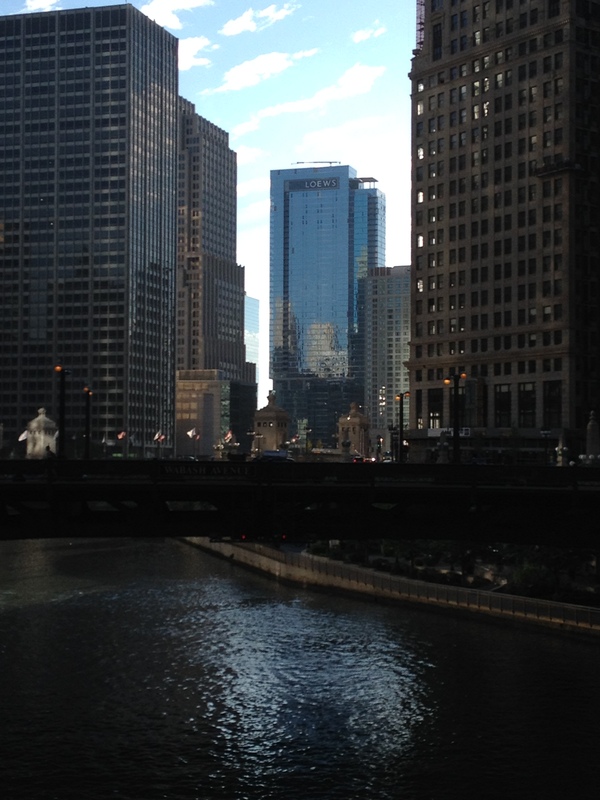 It’s a shot of a building that says “Loews” on it, right along the river. Logically speaking, it too clashes with the “cluster of 1920s skyscrapers” and could spoil the view for the city’s Riverwalk. Did Emanuel blast Loews? Yeah, I missed that press conference too. How about this photo on the right? 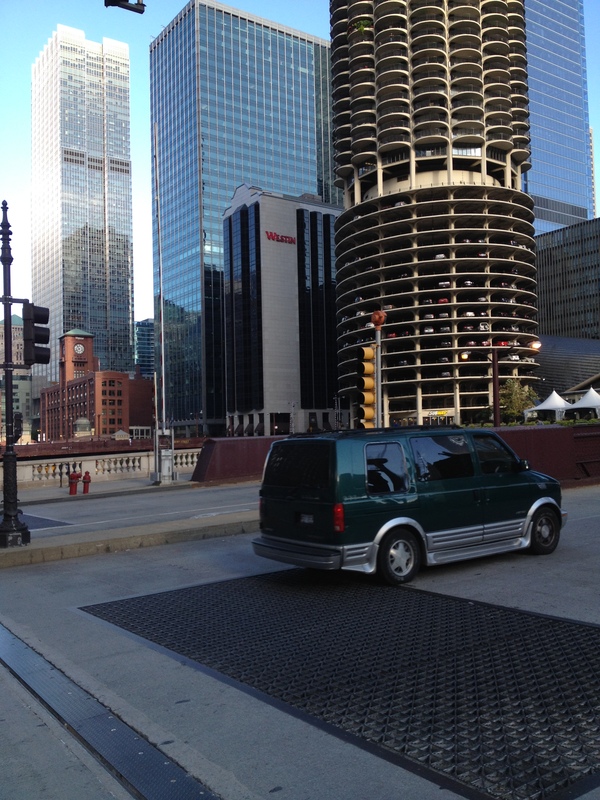 It’s a shot of the Westin Hotel, right along the river. Logically speaking, it also has a name attached to it, just as Trump’s does. Did Emanuel take Westin to task? Hm, I don’t recall him ever blasting Westin either. There are other buildings along the river with names on them but I don’t have room to display all the photos in this post. But I took these two shots right next to the Trump tower…which somehow draws all the attention despite neighbors that do the same thing Trump did. Some liberals howl that it’s the size of the sign that is so offensive. They argue that the sign takes up nearly 2,900 square feet and half-jokingly say that the sign is big in order to match Trump’s ego. What these liberals don’t realize is that the Trump building contains 2.6 million square feet of floor space. A 2,900 square foot sign on the second tallest building in the western hemisphere is merely one-tenth of one percent (0.001) of the size of the building. If you view the infamous letters in person, it actually looks very proportionate to the size of the mammoth building from which the letters hang. This is cause for a new city ordinance? Emanuel’s clash with Trump has nothing to do with architecture but everything to do with ideology and political worldviews. As a liberal, Emanuel jumped at any opportunity to try to dump on the conservative Trump. Whether you are a liberal, conservative or moderate, the facts are the facts. And just as ABC7 revealed that the hypocrisy that Emanuel’s motorcade “regularly” runs red lights and speeds (AND has all those tickets thrown out) despite his public comments about the importance of not running red lights and speeding for safety purposes, the facts here show that hypocrisy again reigned in Emanuel’s lame attempt to diss Trump. Tangential note: after Emanuel was caught by ABC7 for running red lights, Emanuel put a nice public spin on it, saying that he told his drivers: “I said, ‘Follow the law, nobody’s above the law, slow down, period.” But several months later, ABC7 caught Emanuel’s motorcade violating the law eight more times! What a bold, two-faced hypocrite. Emanuel, who—in another display of hypocrisy—didn’t even meet the city residence requirements before running for mayor, is easily the worst mayor Chicago has ever seen, which is saying something. Black preachers, led by Rev. Al Sharpton, said on Tues, Jul 17th they were planning peaceful protests in 100 cities across the United States this weekend to press for federal charges in the shooting death of 17-year-old Trayvon Martin. Attorney General Eric Holder, who is black, told a convention of the nation’s largest black sorority that the U.S. government will press for a federal investigation. Holder is to also address the NAACP on Wed. Protests were held in various cities including Chicago, New York City, Boston, San Francisco, San Diego and Sacramento on Sunday, followed by rallies in Baltimore, Minneapolis, Houston and Atlanta on Monday. Some protests even grew violent as 14 people were arrested including one hospitalized, stores like Wal-Mart and The Men’s Wearhouse were vandalized in California. Everybody, take a deep breath. HOW DO YOU KNOW THE VERDICT WASN’T RIGHT? Zimmerman thought Martin looked “suspicious” as Martin walked through the streets of a gated Florida community, of which Zimmerman was a neighborhood watchman. Zimmerman leaves his vehicle, and after the dispatcher finds out Zimmerman is going to follow Martin, Zimmerman is told not to do that. A fight ensued since forensic experts following the autopsy determined that the gunshot to Martin’s chest was fired at close range (between 1-18 inches), not from long range. Police arrive on the scene, finding Martin dead (one shot to the chest) and Zimmerman with a bloody nose and two lacerations on the back of his head. In other words, between the time Zimmerman trailed Martin until the time Martin was shot dead, we have NO idea what happened. Anyone who claims otherwise is lying. Period. Three witnesses said they either heard or saw a scuffle, with two witnesses providing visual details the indicate Martin was the aggressor on top of Zimmerman. One witness (Rachel Jeantel) was on the phone with Martin before the fight and said that Martin described Zimmerman as “crazy and creepy”. Jeantel was found to have lied about her age when giving her testimony. Autopsy reports on Martin’s body found one small abrasion on his left ring finger below his knuckle and no other injuries. A trace amount of marijuana was also found, but it could have been injested days earlier. Recordings of 911 calls could not ascertain whose voice was yelling for help. Zimmerman’s father was adamant it was Zimmerman’s. Martin’s father initially said the voice was not Martin’s but has since changed his story (claiming he heard an enhanced recording later). So, to all the verdict demonstrators, let me ask you a simple question: how do you know that Trayvon Martin wasn’t the one who attacked first? Simple questions have simple answers: you don’t. It is certainly possible that Zimmerman followed Martin after ending his 911 call, but even that part we don’t know with 100% certainty. And since you don’t know beyond a reasonable doubt what exactly happened between the time Zimmerman ended his 911 call and when Martin got shot, what exactly are you upset about? The whole thing is one big shrouded mystery. For all you know, Martin attacked Zimmerman first, pummeling him while Zimmerman is on the ground (which would explain Zimmerman’s lacerations in the back of his head and the bloody nose), and forcing Zimmerman to shoot in self-defense. The mainstream media went beyond mere bias with this story; it played this story with outright deceit. Even I rushed to judgment and initially believed that Zimmerman was 100% at fault based on the media’s coverage…that Zimmerman followed Trayvon just for being black and then simply shot him from afar. But then things started to come out from non-mainstream sources and that’s when some Minor Insights started to come forth. It reported Martin had Skittles and a sugary drink, as if to insinuate that Martin was like a helpless little toddler (to match the photo the media was posting in their stories). It implied that Martin’s only crime was wearing a hoodie in a white neighborhood. And the black community (and some non-black folks) swallowed it all up—hook, line and sinker. All the Trayvon supporters never noticed that—to this day—we do not have a recent photo of Trayvon. (Psst: the autopsy reported Trayvon was 5′ 11″ at the time he died.) Why is that? All the Trayvon supporters never noticed that Trayvon, though he never had a criminal record, did have an arrest record—four arrests, to be exact. This does not even include his suspensions from school (such as for graffiti and punching a bus driver). Does anyone know Trayvon has a violent streak that, oh I don’t know, maybe came into play in this incident too? The point is, Trayvon is not this Gandhi-like figure that the media portrayed him to be. All the Trayvon supporters never noticed that the media omitted Zimmerman’s response to the dispatcher’s request to not follow Martin, which was “OK”. All the Trayvon supporters never noticed (or just ignored) that NBC intentionally edited Zimmerman’s audio in the 911 call to make it sound like racial profiling. NBC played a recording where Zimmerman said, “This guy looks like he’s up to no good or he’s on drugs or something… He’s got his hand in his waistband, and he’s a black male,” as well as “This guy looks like he’s up to no good. He looks black.” But in the original 911 recording, Zimmerman said: “This guy looks like he’s up to no good. Or he’s on drugs or something. It’s raining and he’s just walking around, looking about.” The 911 operator then asked: “OK, and this guy, is he black, white or Hispanic?”, and Zimmerman answered, “He looks black.” The phrase, “He’s got his hand in his waistband, and he’s a black male” came several exchanges later in the conversation. NBC never apologized on air for its deception. All the Trayvon supporters never noticed that ABC News lied its audience when it showed surveillance video of Zimmerman walking into the police station and declared that no abrasions or blood could be seen in the video. When this claim was disputed, ABC then admitted there were indeed “a pair of gashes” on his head but insisted the story’s main focus was on a doctor who claimed it was unlikely that Zimmerman’s nose had been broken—even though the doctor had never seen Zimmerman. As this blog has been warning since Day 1, be very skeptical about what the mainstream media tells you. So now the NAACP is up in arms. Yet is the NAACP all up in arms when most of the black people who are gunned down in America are gunned down by black people? One black person is shot dead by a white person—and we don’t know exactly how—yet there are rallies and demonstrations and protests and outrage. On the other hand, thousands of blacks people are shot dead by other black people EVERY YEAR—yet where is the outrage from NAACP? Where is Al Sharpton leading rallies and demonstrations over black-on-black crime? Or as one commenter astutely pointed out, when O.J. Simpson, who is black, was acquitted of murdering his white wife Nicole and white Ronald Goldman, where was the outrage then? Oh wait…the NAACP, Jesse Jackson Sr., Al Sharpton and those of their ilk don’t work that way. I’ve experienced racial slurs and discrimination, so I’m not naive to think it doesn’t exist. But this particular shooting was not about race. This particular verdict was not about race. Everyone needs to calm down. Race relations are not healed by knee-jerk reactions and ignorance. Instead, knee-jerk reactions make race relations worse. So put down your “We are all Trayvon” signs.